Duck Soup - His Excellency Is Due! 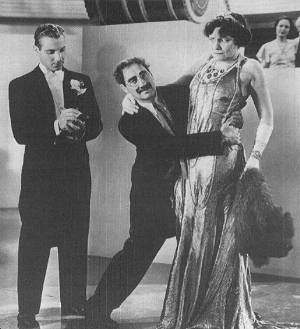 Home | Movies | Duck Soup | Scene: His Excellency Is Due! Mrs. Teasdale: Oh, Your Excellency! We've been expecting you. As chairwoman of the reception committee, I extend the good wishes of every man, woman, and child of Freedonia. Firefly: Never mind that stuff, take a card. Mrs. Teasdale: Card? What will I do with the card? Firefly: You can keep it. I've got 51 left. Now what were you saying? Mrs. Teasdale: I've sponsored your appointment because I feel you're the most able statesman in all of Freedonia. Firefly: Well, that covers a lot of ground...Say, you cover a lot of ground yourself. You'd better beat it. I hear they're going to tear you down and put up an office building where you're standing. You can leave in a taxi. If you can't get a taxi, you can leave in a huff. If that's too soon, you can leave in a minute and a huff. You know, you haven't stopped talking since I came here? You must've been vaccinated with a phonograph needle. Mrs. Teasdale: The future of Freedonia rests on you. Promise me you'll follow in the footsteps of my husband. Firefly: How do you like that? I haven't been on the job five minutes, and already she's making advances to me...Not that I care, but where is your husband? Mrs. Teasdale: I was with him till the very end. Firefly: Hmm! No wonder he passed away. Mrs. Teasdale: I held him in my arms...And kissed him. Firefly: Oh, I see, then it was murder! Will you marry me? Did he leave you any money? Answer the second question first. Mrs. Teasdale: He left me his entire fortune! Firefly: Is that so? Can't you see what I'm telling you? I love you. Mrs. Teasdale: Oh, Your Excellency. Mrs. Teasdale: Oh...I want to present to you Ambassador Trentino of Sylvania. Having him with us today is indeed a great pleasure. Trentino: Thank you, but I can't stay very long. Firefly: That's even a greater pleasure. Now, how about lending this country twenty million dollars, you old skinflint? Trentino: Twenty million dollars is a lot of money. I shall have to take that up with my Minister of Finance. Firefly: Well, in the meantime, could you let me have twelve dollars until payday? Firefly: Don't be scared, you'll get it back. I'll give you my personal note for ninety days. If it isn't payed by then, you can keep the note. Trentino: Your Excellency...Haven't we seen each other somewhere before? Firefly: I don't think so, I'm not sure I'm seeing you now. It might be something I ate. Firefly: Don't look now, but there's one man too many in this room...And I think it's you. Mrs. Teasdale: (To Trentino) Oh, I'm so sorry...(To Firefly) I want you to meet a very charming lady. Mrs. Teasdale: Just a moment! I want to present Miss Vera Marcal. Firefly: Go ahead, I can take it. Mrs. Teasdale: Oh-ho-ho, you don't understand! This is Vera Marcal, the famous dancer. Vera: Perhaps, sometime, we get a chance to dance together, huh? Firefly: I could dance with you till the cows come home. On second thought, I'd rather dance with the cows till you come home...Where's my secretary? Mrs. Teasdale: Good heavens, Your Excellency! Firefly: Ah, take a letter. Firefly: To my dentist...ah...Dear Dentist. Enclosed find check for five hundred dollars...Yours very truly...Send that off immediately! Roland: I'll...um...I'll have to enclose a check first. Firefly: You do and I'll fire you! Mrs. Teasdale: Your Excellency...The eyes of the world are upon you. Notables from every country are gathered here in your honor. This is a gala day for you. Firefly: Well, a gal a day is enough for me...I don't think I could handle any more.